Brief: Our analysis reveals that India has improved on its energy intensity over the past six years. In FY18, only 0.30 mega joules of energy are required to produce every Rs. 1 worth of GDP as compared to 0.36 mega joulesearlier. Even the economy's energy requirement has dropped as compared to several peers due to greater systemic efficiencies. India's energy intensity of GDP has improved significantly in past six years. Energy requirement for producing one-rupeeworth of GDP has dropped to less than 0.30 mega joules in FY18 from 0.36 mega joules six years ago. The energy efficiency is primarily due to smart metering that reduced energy wastage as well as bettering efficiencies in the supply chain. 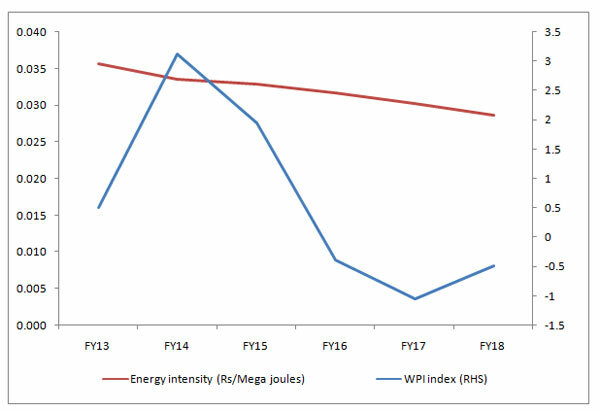 As a result, electricity price in WPI index has also witnessed de-growth in the past four years. This indicates the economy is becoming energy efficient. In a comparison with other economies, India's energy requirement for generating one USD of GDP has dropped to 0.102 kilo oil equivalent (koe) in 2017 from 0.117 koe, seven years earlier. However, as compared to the advanced countries such as Germany, France and Japan, India's energy intensity still needs improvement. China, on the other hand, being a manufacturing based economy and still largely thermal based, has an energy intensity of 0.138 koe. The economy has only reduced energy intensity by 0.046 koe during the seven-year period. As India advances and becomes more industrialized by way of capital intensivety, the gains achieved over the period may however be not as steep. This is in line with the Chinese example, where energy intensity remains on a higher side.